In a public forum last night at the Lansdowne Hotel, NSW MPs, City of Sydney councillors and representatives from cultural, music and hospitality sectors gathered to discuss one of the hottest political agenda items for Sydney: What will it take to restore Sydney's nightlife? Following the forum, the NTIA has formally called on the Berejiklian Government to match the opposition’s efforts and appoint a Minister for the Night-time Economy ahead of the NSW state election. Chair of the NTIA, Michael Rodrigues said: “Right now, we don’t have a clear vision. We need gusto and bold action from inside the government. Unless we have a Minister who takes responsibility for the night-time economy, we won’t see the follow-through that’s required to change the dire situation Sydney has found itself in as a cosmopolitan, global city past 8pm. “We want to cut the red tape that’s been suffocating our city and build a new wave of energy, innovation, and creativity. The night is an asset, and it’s being wasted. Let’s unite for the night, rebalance the regulation, and build a new narrative based on the positive outcomes that come from a dynamic night time economy - a vibrant city that inspires its people and is powered by creativity." Lansdowne Hotel owner Jake Smyth agreed: "Our culture needs it, our culture demands it. It demands a commitment to a community." Kerri Glasscock, Sydney Fringe Festival CEO, noted there was a bias against cultural events held after dark. "Anything that you are doing is deemed high risked at nighttime," she said. "There is a perception that anything that happens in the arts and culture at night intrudes on people safety." However, activity after dark in Sydney is now worth $27 billion a year and supports more than 230,000 jobs - making up 3.8% of Australia’s economy. This falls well short of other world-class city leaders, such as the UK, where night-time is worth 6% of the economic contribution. The NTIA has asked: with pressure on music festival regulations and the stream of closing venues, how can Sydneysiders support our much-loved creative culture, especially at a time when the battle feels more daunting than ever? 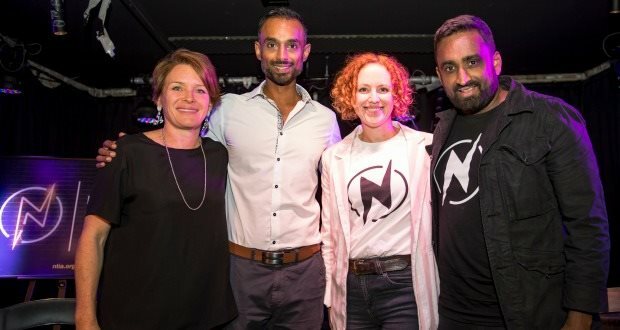 Pictured: last night's panel featured Michael Rodrigues, Spokesperson, Night Time Industry Association; Justine Baker - CEO, Solotel Group; Kerri Glasscock - CEO, Sydney Fringe Festival; and owner, Venue 505; and Kamran Ahmed - CEO, Rave Reviewz.